Santo Domingo ([ˈsanto ðoˈmiŋɡo] meaning "Saint Dominic"), officially Santo Domingo de Guzmán, is the capital and largest city in the Dominican Republic and the largest metropolitan area in the Caribbean by population. In 2010, its population was counted as 965,040, rising to 2,908,607 when its surrounding metropolitan area was included. The city is coterminous with the boundaries of the Distrito Nacional ("D.N. ", "National District"), itself bordered on three sides by Santo Domingo Province. 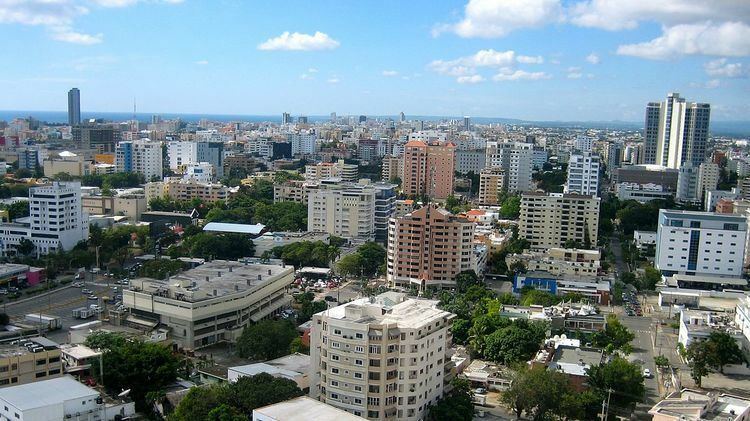 Santo Domingo is the cultural, financial, political, commercial and industrial center of the Dominican Republic, with the country's most important industries being located within the city. Santo Domingo also serves as the chief seaport of the country. The city's harbor at the mouth of the Ozama River accommodates the largest vessels, and the port handles both heavy passenger and freight traffic. Temperatures are high year round, with a cool breeze around winter time. 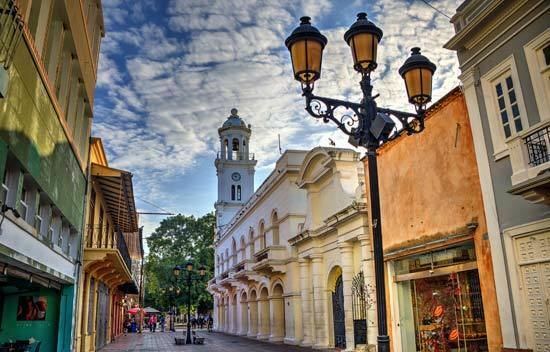 Dating from 1496, when the Spanish settled on the island, and officially from 5 August 1498, Santo Domingo became the oldest European city in the Americas. Bartholomew Columbus founded the settlement and named it La Nueva Isabela, after an earlier settlement in the north named after the Queen of Spain Isabella I. 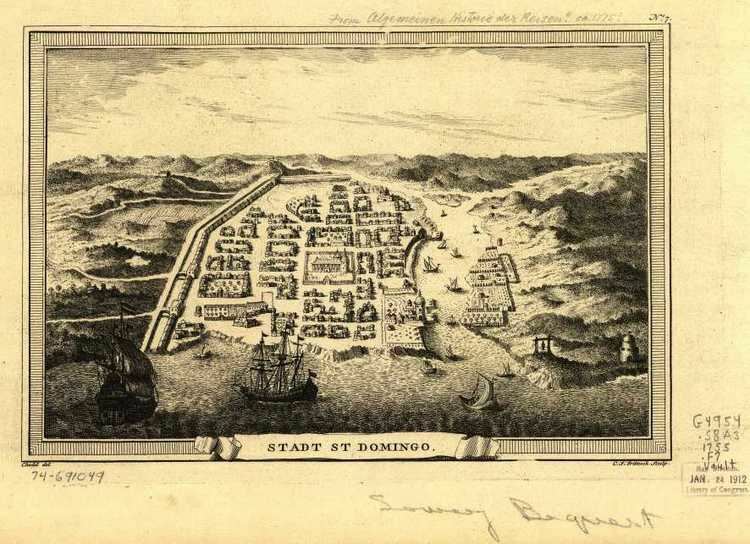 In 1495 it was renamed "Santo Domingo", in honor of Saint Dominic. Santo Domingo came to be known as the "Gateway to the Caribbean" and the chief town in Hispaniola from then on. Expeditions which led to Ponce de León's colonization of Puerto Rico, Diego Velázquez de Cuéllar's colonization of Cuba, Hernando Cortes' conquest of Mexico, and Vasco Núñez de Balboa's sighting of the Pacific Ocean were all launched from Santo Domingo. 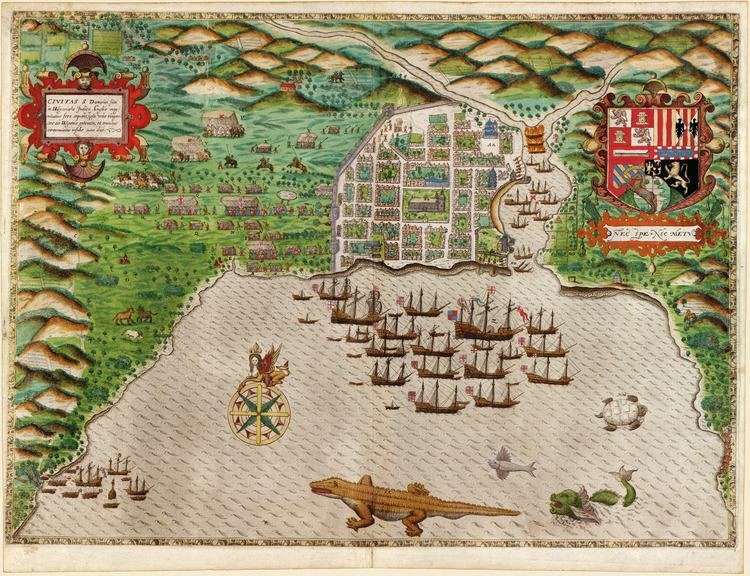 Diego Colon arrived in 1509, assuming the powers of Viceroy and admiral. In 1512, Ferdinand established a Real Audiencia with Juan Ortiz de Matienzo, Marcelo de Villalobos, and Lucas Vazquez de Ayllon appointed as judges of appeal. In 1514, Pedro Ibanez de Ibarra arrived with the Laws of Burgos. Rodrigo de Alburquerque was named repartidor de indios and soon named visitadores to enforce the laws. On 27 February 1844 Santo Domingo was again the capital of a free nation, when it gained its independence from Haiti, led by Dominican nationalist Juan Pablo Duarte. The city was a prize fought over by various political factions over the succeeding decades of instability. In addition, the country had to fight multiple battles with Haiti; the Battle of 19 March, Battle of 30 March, Battle of Las Carreras, and Battle of Beler, are a few of the most prominent encounters, mentioned in the national anthem and with city streets named after them. In 1861 Spain returned to the country, having struck a bargain with Dominican dictator Pedro Santana whereby the latter was granted several honorific titles and privileges, in exchange for annexing the young nation back to Spanish rule. The Dominican Restoration War began in 1863 however, and in 1865 the country was free again after Spain withdrew. The city's most important historical buildings include the Catedral Santa María La Menor, called La Catedral Primada de América, America's First Cathedral, which states its distinction; the Alcázar de Colón, America's first castle, once the residence of Viceroy of the Indies Don Diego Colón, a son of Christopher Columbus; the Monasterio de San Francisco, the ruins of the first monastery in the Americas; the Museo de las Casas Reales, in a monumental complex that includes the former Palace of the Governors and the building of the former Royal Audiencia of Santo Domingo; the Fortaleza Ozama, the oldest fortress in the Americas; the Pantéon Nacional, a former Jesuit edifice now hosting the remains of various renowned Dominicans; and the Dominican Convent, the first convent in the Americas. 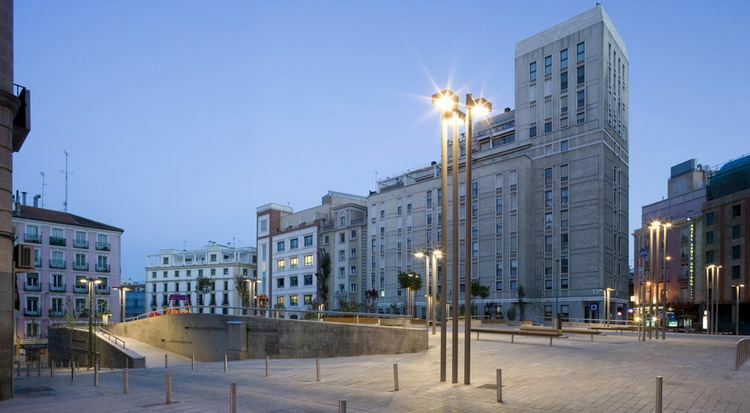 On the north end of Calle Las Damas, the restored and expanded Plaza de España is bordered by Las Atarazanas (former naval yard, now a museum) and a number of small shops and restaurants. This area was the first European commercial center in the Americas, and is still a hub of activity today. The Alcázar de Colón, having once been the colonial palace of the Columbus family—beginning with his son Diego – is now a museum displaying period furniture and decorations. The building was originally built in 1510, and restored to its current appearance in 1952. The city's economic growth can be witnessed in the extensive vertical growth experienced across many of its neighborhood. The construction boom is reflected in the many high density residential towers, shopping malls, elevated highways, the metro expansion and overall increase in commercial activity. Santo Domingo has an underground and elevated rapid transit metro system. It is the most extensive metro in the Caribbean and Central American region by total length and number of stations. The Santo Domingo Metro is part of a major "National Master Plan" to improve transportation in the city as well as the rest of the nation. The first line was planned to relieve traffic congestion in the Máximo Gómez and Hermanas Mirabal Avenue. The second line, which opened in April 2013, is meant to relieve the congestion along the Duarte-Kennedy-Centenario Corridor in the city from west to east. As of August 2013, the metro consists of these two lines. Four more lines are planned to be constructed in the near future, for a total of six. Before the opening of the second line, 30,856,515 passengers rode the Santo Domingo Metro in 2012. Santo Domingo is served by two airports. Aeropuerto Internacional La Isabela a newly constructed airport located in the northern section of the city, within kilometres of the city center. It serves mostly domestic and charter flights. The major international airport that serves the city is Santo Domingo Las Americas, which serves North and South America and also Europe.